Tim Hetherington was the British photojournalist who collaborated with Sebastian Junger on the making of Restrepo, the documentary of life on a combat outpost in eastern Afghanistan. Later, in 2011, Hetherington was killed in Libya during the civil wars there. His pictures that interest me most are those taken “inside the wire”—soldiers lounging about, roughhousing, or sleeping in their forlorn combat outposts. The times in-between the patrols and other missions that take them “outside the wire” into the much more dangerous open spaces. Considered as a slice of deployed life, the photo strikes a nerve that those who haven’t served might not understand completely. In the Army, “uniform discipline” is a big deal. The idea is that it is important for soldiers to adhere to uniform standards—everyone at all times in the prescribed uniform. To uniformity zealots, that soldiers are allowed to idle about shirtless in the daytime is probably the reason things aren’t going so well in Afghanistan on the grand scale. The breakdown of uniform standards, the thinking goes, is a clear indication of a sloppy, badly-led unit. More than half believing this sentiment myself, I never let my soldiers in Afghanistan be “out of uniform” in my presence or when they were outside the wire, conducting missions, and otherwise representing the unit. Be that as it may, the photo speaks more directly to another aspect of the war experience. The happy soldiers suggest that, death and petty uniform policies aside, life on a combat outpost was a man’s man’s idyll of guns, muscles, and tattoos. Smoking and joking, they wait for the next battle to begin. Everything about it is characteristic: the low light, the wood bunk, the “poncho liner” blanket, the gear and water bottles stewn about, the blue bedding and green white-flecked tiles—apparently standard issue across Afghanistan. The bare feet adding poignancy to it all. In the first picture, the soldiers laugh by day, stripped nearly naked. 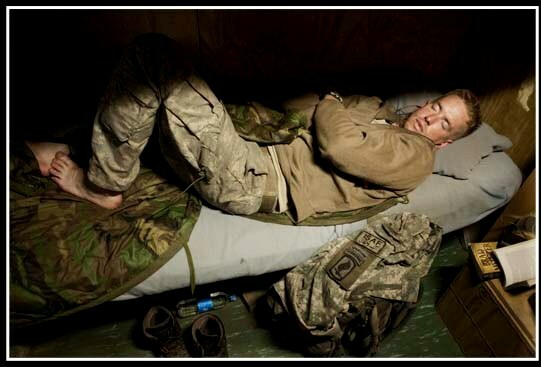 In the second, the soldier, contorted and not looking very comfortable at all, sleeps at night with his uniform on.